Personalized Oblong Plaque with Rope Border - - 16" x 6" one line sign. Wall mount or lawn mount with optional lawn stakes. Made in USA. 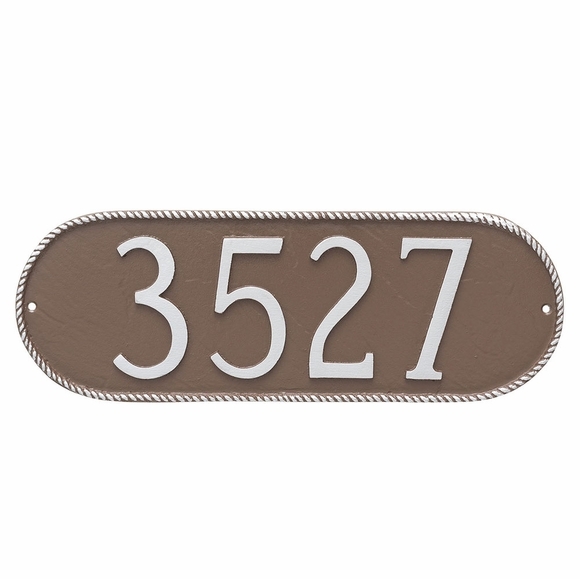 Oblong shape address plaque accented with a delicate rope border. Holds up to five large 4" characters or eight eight 2" characters (either address numbers or your name). these three premium combinations - - Aged Bronze/Gold, Swedish Iron/Black, Swedish Iron/Silver. Personalized aluminum sign holds five large 4" characters. Wall mount or lawn mount. Thin rope border accentuates the unusual oblong shape. Made in the USA.